1 double bed or 1 trundle bed. Patio. Desk. In-room safe (accommodates laptop). Wireless high-speed Internet access (complimentary). Flat-panel television. Phone. Minibar. Coffee/tea maker. Private bathroom. Makeup/shaving mirror. Bathroom phone. Hair dryer. Wheelchair accessible. Blackout drapes/curtains. Air conditioning. Window opens. From Monday 21 January 2019 until Thursday 31 December 2020: Enjoy 10 % off! From Monday 21 January 2019 until Thursday 31 December 2020: Enjoy 15 % off! 1 trundle bed or 1 bed. Patio. Desk. In-room safe (accommodates laptop). Wireless high-speed Internet access (complimentary). Flat-panel television. Phone. Minibar. Coffee/tea maker. Private bathroom. Makeup/shaving mirror. Bathroom phone. Hair dryer. Wheelchair accessible. Blackout drapes/curtains. Air conditioning. Window opens. 1 double bed or 1 sofa bed. Patio. Desk. In-room safe (accommodates laptop). Wireless high-speed Internet access (complimentary). Flat-panel television. Phone. Minibar. Coffee/tea maker. Private bathroom. Makeup/shaving mirror. Bathroom phone. Hair dryer. Wheelchair accessible. Blackout drapes/curtains. Air conditioning. Window opens. The Eurostars Grand Central matches modern and innovative architecture with the bright colours of the interiors: orange, red and purple. 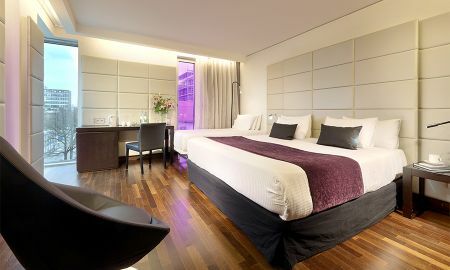 The hotel offers spacious and modern rooms, a sauna, an indoor pool, a Jacuzzi and a terrace where you can sunbathe. 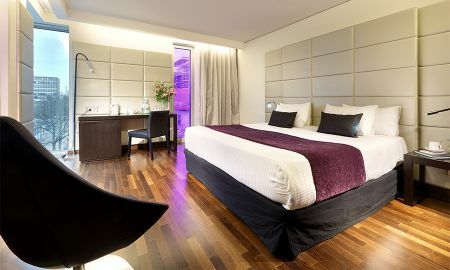 All rooms at the Eurostars Grand Central feature an original design and ideal comfort: wooden floors, double or extra-large beds and ultra-modern bathrooms. 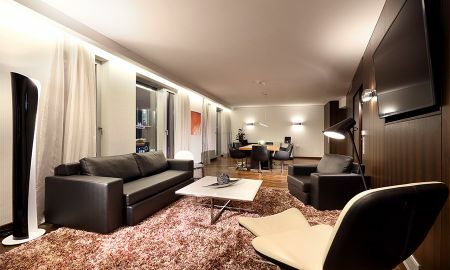 Guests will feel like inside a building with the latest technology, while those who already live in a flat will feel welcomed home away from home. The magnificent conference rooms at the Eurostars Grand Central come with the latest equipment to ensure successful meetings: they are completely versatile and adjustable to any type of function. 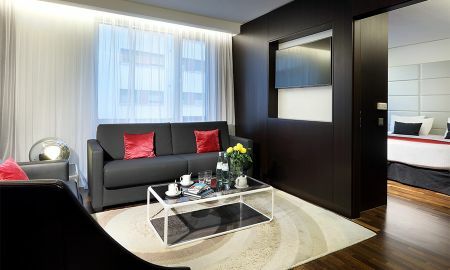 The Eurostars Grand Central is perched on the Maxvorstadt within walking distance of the Marienplatz and Karlplatz, the city’s two most well renowned locations. 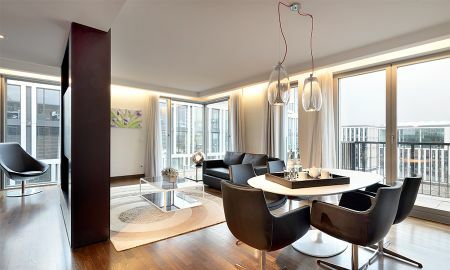 Just 10 meters from the hotel’s main entrance, a hotel tram is available to whisk guests off to museums, the football stadium Allianz or Olympia, and the city’s airport. Flanked on all sides by the highest level of cultural centers the city has to offer, including the theater Munchner Volks, the Bavarian State Opera, Theatre and Cuvilliés Kunstarea (the arts district) houses the Museum of Ancient Art, the Museum of New Art and the Museum of Contemporary Art, the hotel boasts a prime spot from which to discover the city’s historical delights.